The seedlings looked basically the same as my last posted picture on Friday. They were about 2 inches tall. Then I left town. And the snow peas went nuts! Two and a half days later, this is what I came home to! They are more than a foot tall now! What the heck do I do with them now?? I wasn't expecting to transplant them for a few weeks. Now I am going to have create a wire grid for them to grow on and all of that. Hope they can wait until the weekend, because I have no idea how I can do that during the week. PLUS, it's supposed to get really cold! Any suggestions? On the other hand, I did discovery why they are called "snow" peas. Apparently, they like the cold. Also, if you look on the left of the picture, you will see seedling chives and basil. The baby chives are adorable. 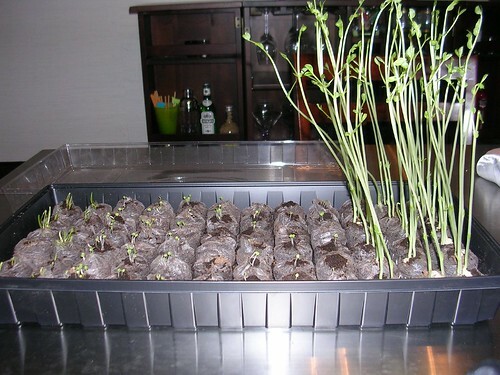 They look just like full grown chives, but they are in miniature. If you want to see a better picture of the chives and basil, click on this picture and navigate through the baby seedlings set.